Introduction: Differential diagnostics of cystic cervical neoplasia is sometimes difficult. Genuine branchiogenic carcinoma, which means carcinoma in lateral cysts of the neck, are rare. Case presentation: A 51 year old patient presented with a 4-week history of a progressive swelling postero-inferior to the right mandibular angle. Ultrasound of the neck showed a well defined, shmoothly shaped and homogenous cystic mass without hilus sign. A computed tomography scan of the head and neck revealed a 40mm hypodense mass in Level IIa, most likely a central necrotic lymph node metastasis. An 18FDG PET-CT scan revealed a rounded, metabolic active mass with central hypodensity in the right carotid triangle. There was no clinical or radiographic sign for any primary cancer. The mass was excised. Result: Microscopic examination revealed a branchiogenic carcinoma. We applied a functional neck dissection on the right side and a bilateral tonsillectomy. The right tonsil contained a 2,2cm squamous cell carcinoma which infiltrated almost the whole tonsil (pT2, pN2a, M0). Discussion and Conclusion: On assumption of a Cancer of unknown primary (CUP) we performed a PET-CT scan, which is clearly superior to single PET, CT or MRI. Despite the size of 2,2cm the primary cancer could not clearly be determined. First histologic examination revealed a branchiogenic carcinoma, which would be a rarity. Proof was given through diagnostic tonsillectomy, which is recommended for CUP of the head and neck but not in branchiogenic carcinoma. It has to be clarified whether branchiogenic carcinoma is a unique entity. Introduction: The clinical management of traumatic tooth loss in infant and adolescent denture poses a particular challenge for the surgical treatment due to the resulting local bone and soft tissue deficit. The "two-phase transplantation concept" (TPTX) has been developed to account for adequate recovery of aesthetics and function by reliably maintaining the growth of the youthful jaw up to early adulthood. Material and Method: In the primary and early mixed dentitions (age 4 to 10) the not yet exfoliated primary canines are used as tooth substitutes for the upper lost permanent incisor (phase I). Exfoliation of the transplanted primary canines occurs either spontaneously or due to the growth of the adjacent erupting teeth. In phase II (> 10 years of age), premolar transplantation can be applied for long-term rehabilitation of the adolescent jaw. Results: Autogenous transplantation (autoTX) of primary canines reliably stimulates the growth of local bone in the anterior upper jaw. Mean 5-year survival rate for primary canines autoTX assessed by Kaplan-Meier estimator was 87% (n=14). The survival rate of premolar autoTX is reported in the literature to be over 90% after 33 years which is supported by our own data (mean 3-year survival rate: 100%, n=24). Patient satisfaction, assessed by a questionnaire, resulted in excellent school grades for both primary canine (1.5) and premolar autotransplantation (1.7), respectively. Conclusion: This biological therapeutic approach to dental trauma is new by basing on the natural exfoliation of the primary tooth transplant in the early phase I and, if necessary, on premolar autotransplantation in the later phase II of therapy, thus allowing the rapid rehabilitation of children and adolescents with avulsed upper central incisors. A polytrauma often needs an interdisciplinary team approach. Maxillofacial injuries such as maxillary or mandible fractures can occur in about 20% of cases. Injuries to the neck due to explosion injuries can cause severe and lifethreatening situations, especially in facial burn injuries. Airway management may be aggravated due to inhalation injuries. Case report: a 19 year old fire fighter suffered a combination of a high velocity shrapnel injury and a severe facial burn. We show the successful management of an interdisciplinary team approach of plastic and maxillofacial surgery. Background: Even today mycotic infection of the maxillary sinus is not a very rare disease. In most cases, Aspergillosis is the underlying pathogen and is associated with root canal filling - contains zinc oxide - that has been pressed into the maxillary sinus through the root tip. Most of the time aspergillosis remains non-invasive. However, the invasive form presents itself with a life-threatening condition due to potential destructive cranial progression. Often times diabetic or immunocompromised patients are affected. Goals: The mycotic infection of paranasal sinuses requires thorough understanding of the underlying causes, possible surgical and anti-mycotic treatment options, and the willingness to work in an interdisciplinary setting with various clinics and sub-departments. Methods: We exemplary choose 3 patients with a histopathological diagnosed mycosis of the maxillary sinus, we treated in our clinic. Patient 1 (male, 68 years old) was transferred to us from the Department of Neurology after suffering from therapy-resistant headaches for two weeks and sudden paresis of the third cranial nerve. A sinusitis maxillaris due to aspergillus fumigatus with affection of the left orbita and complete paralysis of the occulomotoric nerve could be diagnosed. Patient 2 (male, 59 years old) presented himself with painless swelling of the cheek without dentogenic focus. The underlying cause was right-sided rhinocerebral mucor-mycosis due to chronic sinusitis maxiallaris with subtotal destruction of the zygomatic bone. Patient 3 (female, 80 years old) was transferred from the Department of Opthalmology due to left-sided periorbital swelling. The underlying cause was sinusitis due to aspergillosis infection. Results: 2 out of 3 patients suffered from a predisposing condition: ulcerative colitis and renal insufficiency; as well as collagenous colitis. 2 out of 3 patients received prior root canal treatment. In all cases surgical treatment (sanitization of the maxillary sinus and decortication) as well as systemic anti-mycotic therapy were applied. 2 out of 3 patients received additional local treatment via a drainage system. Conclusion: Root canal treatment and persistent symptoms require early 3D-imaging of the perinasal sinuses (especially in the case of diabetic or immunocompromised patients). The rapid confirmation of the diagnosis and the combined treatment (includiung surgical sanitation and systemic anti-mycotic therapy) are crucial for the outcome of the patient. Interdisciplinary treatment between Maxillofacial Surgeons and Infectious Disease Specialists leads to positive long-term results (follow-up duration of 18 months). Background: Highly acute oro-dentogenic infections with rapid dissemination - like in the case of necrotising fasziitis (NF) or a phlegmonous deep neck infection (DNI) occur very rarely. However, they require immediate therapeutic intervention. Especially in the case when the immune system is weakened (diabetes mellitus, immuno-suppressive pathologies,etc.) they correspond with high morbidity and mortality. Goals: It is crucial to understand the disease progress and to be familiar with deep neck spaces and fascial planes. Despite advanced surgical treatment, deep neck infections and even more necrotising fasciitis can have poor outcome due to their common and potentially life-threatening complications: airway obstruction, descending mediastinitis and sepsis. Knowledge about fast treatment, airway security, efficient drainage, debridement and appropriate antibiotics is essential. Methods: Three exemplary cases were chosen to outline disease progression including life-threatening complications and therapeutic intervention. Patient 2: NF due to necrotising cutaneous metastasis of a squamous cell carcinoma (SCC) originating at the bottom of the mouth. Patient 3: NF with unclear focus in the head≠ck region and immunosuppression due to DM type II. Results: After being admitted to the emergency room all patients received full surgical therapeutic intervention (large scale debridement, airway security through tracheotomy, as well as extensive antiobiotic treatment). Despite immediate referral to the intensive care unit 2 out of 3 patients passed away. Conclusion: Even rapid and radical surgical intervention accompanied by antiobiotic treatment does not guarantee higher survival rates in case of NF and DNI. Early diagnosis is crucial. Despite this radical treatment the prognosis remains poor and has not improved significantly over the last 50 years. No evidence-based proof exists regarding the effectiveness of further adjuvant therapy options such as hyperbaric oxygentherapy. However, if available, they should be administered as ultima ratio. Background: Soft tissue injuries with traumatic penetrations of foreign bodies occur fairly often and also known to involve the orbital region. Most of the time the trauma pattern is known or self-explanatory. In those cases, primary surgical removal of the foreign body is administered after diagnostic confirmation. However, rare and exceptional cases occur where the patient history and conventional diagnostic methods are not effective. The following presents an example of an unambigious case as well as an intricate one. Goals: Penetrating foreign bodies in the ocular orbit are a common injury to the face. These foreign bodies stem from diverse organic and non-organic compositions and require individual trauma management. The goal of this poster was to present two cases similar in trauma pattern but with very different compositions of the penetrating foreign objects. As well as the challenges presented to the clinicians by a variety of possible foreign bodies. Methods: A 5-year-old boy (Patient 1) is brought to our clinic after stabbing himself with a pencil in his right periorbital region while playing. He presents himself with an one-sided eyeglass haemorrhage and a tear injury to his right upper eye lid. With low-dose CT the clinical suspicion is confirmed that a piece of the pencil remained within the orbita. During endotracheal anaesthesia the foreign body is extracted without complications. A 22-year-old male patient (Patient 2) presents himself to our clinic with a swollen upper left eye lid and ptosis of the same eye. According to his patient history he only states that he woke up intoxicated in a forest. Since radiological diagnostics (first ultrasound examination, then CT, and finally a MRI) did not yield a specific cause and the clinical finding progressed steadily, surgircal exploration was performed. During the exploration a small wooden branch was found. Afer surgical removal of the wooden foreign body the symptoms of the patient completely regressed. ultrasound of the lid and orbit can be attempted but should be performed by an experienced examiner. Suspective facial wounds, specifically, should always be transferred to a specialized maxillofacial surgeon. Conclusion: After trauma with possible penetration of a foreign body radiological diagnostic procedures are not 100% accurate. In conventional-diagnostic cases which are unclear the surgical exploration is an established diagnostic procedure, that - if successful - yields positive therapeutic effects at the same time. Oral squamous cell carcinomas (OSCC) around dental implants appear cumulated in patients who have still been diagnosed and have received therapy for oral squamous cell carcinomas. Ongoing cigarette consumption often combined with alcohol abuse also seems to be the main reason for their arising. However a preexisting dental implant induced tissue irritation/peri-implantitis without nicotine or alcohol cunsumption seems to promote the growth of oral malignoms for itself. The clinical problem in identifiying these tumours dues to its mimikry of peri-implant inflammation. 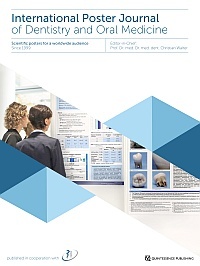 In this poster we demonstrate three cases of patients with resected squamous cell carcinomas in the soft tissue of the lower jaw who got dental rehabilitation with implants after at least one year without recurrence of the tumours. In the controls after dental implantation new squamous cell carcinomas occured around these implants imitating peri-implant irritation. Extensive soft and hard tissue resection with explantation of the implants and local adjuvant radiation was proceeded. Up to now (more than two years) the three patients are presenting a relapse free disease process. Aim: Reconstruction of large mandible defects can be done by using fibula grafts with one- or two stage implantation of dental implants. Preformated guided planning offers the opportunity to use a primary dental arch bar as a fixateure externe. This grounds on a precise guidance through a drilling template. The aim of this study was to determine the accuracy of such a preformed implant-drilling template. Material/methods: In 4 stages 4 dental implants (Astra Dentsply 4,0x10mm) were placed in porcine bone (spongious and long bone) using a preformed drilling template for perpendicular implantation. Bone was not osteotomized. An dental arch bar (Astra ISUS) was screwed to the implants with 9 Ncm torque. Contact x-rays and conical digital volume tomography was done of the implants. The vertical distance between the inner thread and the conical connection was measured on both sides of the implant. Pivot of the implants was measured in two perpendicular planes. The gap difference and angulation of the inner implants were compared. Results: The dental arch bar did not fit to all 4 implants in any stage. The outer implants could only be loaded on one side in 3 stages, in 1 stage none of the outer implants could be loaded. Pivot went up to 6,48° (1st plane) and 12,93° (2nd plane). The inner implants showed a gap difference of 0,56mm (± 0,37) resp. angulation difference of 1,47° (±0,22) - 1st plane/3,83° (±3,28) - 2nd plane - to each other. Discussion/conclusion: Even with guided drilling implant and planned position are differing from each other. Special emphasis has to be set on the inner implants as osteotomy to the outer implants could compensate some deviation - regardless a variation in the position of the inner implants was present. This means primary use of a dental arch bar with four point fixation is limited. A resolution could be the use of a bar separated in the middle to compensate through the mobility of the osteomized segments. In conclusion the use primary dental arch bar is applicable. A fair number of patients concurrently suffer from chronic rhinosinusitis and an aesthetically disturbing deformation of the nose. This group of patients is increasingly requesting simultaneous sinus surgery and aesthetic nose correction. Progresses made in the areas of rhinology surgery as well as endoscopic sinus surgery (FESS) in the last 25 years have entailed a review of the venerable principle of lagged rhinoplasty. Several surgeons began combining rhinoplasty with FESS where feasible. The few publications on this subject clearly state that the rate of infections or complications for both procedures conducted separately is low. Thus, no additional risk of common complications is seen in a combined surgical operation. The combined surgery FESS/rhinoplasty proves to be a foreseeable, secure and effective procedure significantly contributing to the patient's satisfaction when taking only mild and moderate forms of chronic rhinosinusitis into consideration, relinquishing complex exterior nose reconstructions and when put in the hands of experienced and specialized surgeons in a multidisciplinary surgical team consisting of the fields of ENT surgery as well as maxillofacial surgery or plastic surgery. Introduction: Aim of this study is to analyze the influence of geranylgeraniol (GG) on cell viability, migration ability and apoptosis rate of endothelial progenitor cells (EPC) after bisphosphonate treatment in vitro. Material and Methods: EPCs were isolated from human peripheral blood and cultured. The cells were incubated with different non nitrogen- and nitrogen-containing bisphosphonates (clodronate, ibandronate, pamidronate, zoledronate; 0, 5, 50 µM) and substituted with GG (10 µM). A second experimental series without GG served as controls. After 72 h, cell viability was analyzed by a MTT- and Presto Blue-assay. Migration ability was detected by a migration-assay and apoptosis rate of the EPCs was analyzed by a Tunel- and a Toxi Light-assay. Results: Negative effects of the nitrogen-containing bisphosphonates on EPCs could be shown in the test lines without GG in all assays. In the GG test lines, EPC demonstrated a significantly increased cell viability (MTT/PrestoBlue: p each <0.05) and migration ability (Scratch wound/migration: p each <0.05). Concerning the apoptosis rates, a decreased number of apoptotic cells in the Tunel-assay (p each <0.05) and a decreased adenylate kinase release in the ToxiLight-assay (p each <0.05) could be observed. Concerning the non nitrogen-containing clodronate, whether in the test line without GG nor in the test line with GG significant differences could be demonstrated in any assay (p each >0.05). Discussion: GG substitution rescued the negative effects of bisphosphonates on EPCs significantly. GG might improve the reduced angiogenesis after bisphophonate treatment in vivo and therefore improve the wound healing in the affected patients. Introduction: It was shown in cell cultures of different malignomas that chloroquine results in an increased apoptosis rate. Therefore current research evaluates this agent alone or in combination with other therapeutics for treatment of these malignant diseases. The aim of this study was to analyze the effect of chloroquine on the viability and apoptosis rate of squamous cell carcinoma (OSCC) in-vitro. Materials and Methods: Cells of the tumor cell lines PCI1 and SCC68 were incubated for 24h with increasing concentrations (10, 30 and 50μg/ml) of chloroquine. Untreated tumors cells were used as controls. Apoptosis rate was evaluated by fluorometric determination of the activity of caspase 3 and 7. The viability of the tumor cells was checked by WST-assay. All tests were conducted at least five times. For statistical analysis a student's t-test was performed at a significance level of 5%. Results: The in vitro study shows a dose -dependent degradation of the cell viability for both tumor cell lines: (PCI1: 0µg/ml: 100%; 10µg/ml: 77%; 30µg/ml: 65%; 50µg/ml: 60% [p=0,01, for control versus 50µg/ml]; SCC68: 0µg/ml: 100%; 10µg/ml: 62%; 30µg/ml: 39%; 50 µg/ml: 21% [p<0,001, for control versus 50µg/ml]). Corresponding to this are the results from the caspase assays with a concentration dependent increase in apoptosis rate compared to the untreated control cells (PCI1: 10µg/ml: +46%; 30µg/ml: +160%; 50µg/ml: +220% [p=0,006, for control versus 50µg/ml]; SCC68: 10µg/ml: +195%; 30µg/ml: +329%; 50µg/ml: +330% [p=0,002, for control versus 50µg/ml]). Conclusions: The incubation of the OSSC cells with chloroquine resulted in a dose-dependent degradation of the cell viability and consecutive increase of the apoptosis rate. Therefore, Chloroquine could potentially be useful for the therapy of the OSSC which has to be evaluated in further in vitro and in vivo studies. Introduction: Oral squamous cell carcinoma (OSCC) of the buccal mucosa and the upper jaw are rare compared to other sites within the oral cavity and only few studies can be found concerning these localizations only. Therefore the impact of different factors on the recurrence of both tumors were analyzed retrospectively. Material and methods: All patients with OSCC of the buccal mucosa and the upper jaw between 1988 and 2013 were analyzed and compared. Epidemiologic as well as risk factors and therapeutic strategies were investigated. Furthermore T-, N-, R- and G-classification and radiation were correlated to the incidence of recurrences. Results: 113 patients (49% ♀, 51% ♂) with a median age of 65±13a (♀:68±14a,♂:58±11a) with buccal and 138 patients with maxillal OSCC with a mean age of 66±13a (♀:71±13a,♂:63±12a) were treated within the investigated period. Follow up was 48 months on average. 97% of buccal and 92% of maxillal OSCC were operated primarily. Comparison showed significantly higher recurrence rates for buccal OSCC for N0-, R0- and G1-classifications. Almost half of all buccal OSCC (49.6%) showed recurrence in the follow-up period, whereas OSCC of the upper jaw only recidivated in 26.1% of all cases. Within the radiated group 50% recurrence was observed for buccal OSCC and only 32.2% for the upper jaw. The median period until recurrence was observed was 11.5 (range 2-184) months for buccal and 13.5 (range 4-140) months for maxillal OSCC. Discussion: OSCC of the buccal mucosa shows a very aggresive behaviour with early recurrence. Significant differences were observed in comparison to OSCC of the upper jaw. Koch, Felix Peter / Fuchs, Olaf / Götze, E. / Schulz, P. / Moergel, M. / Wentaschek, S. / Wegener, J. / Wagner, W.
Introduction: Large defects oft he human face regularly occur after Head&Neck trauma or cancer resection. They often cause esthetic as well as functional disorders, especially if the dental arch is affected. For a esthetic and functional reconstitution 2-4 operations are necessary. We present a new technique providing the reconstruction of the mandible combined with prothodontic rehabilitation by a single operation . Methode: The 58years old patient presented with a near total defect oft he mandible after cancer resection and primary reconstruction by a titanium plate which perforated the skin within the first year. Aiming a complete reconstruction oft he mandible, the gingiva and the deeth, a 3D model oft he skull was manufactured and upper as well as lower jaw protheses. Positioning the mandibular joints in the centre of the fossae, four dental implants have been planned to provide a quatrangular base for the lower jaw prothesis. The position oft he fibula segments as well as their angulation and lengths were adapted to the implant position. After, the molded fibula, bearing already the dental implants has been transformed into its natural straight appearance again to design the sawing splint and the implants drilling guide. To provide the correct angulation of the fibula segments a CAD/CAM dental archbar was manufactured from Titanium. This new approach of an prefabrictaed archbar fulfills three function: 1. It bears the prothethis 2. It stabilizes the molded fibula as a fixateur externe 3 it positions the complete fibula with rhe prothesis in a correct relation to the upper jaw, indicated by the protheses. Conclusion: This innovative approach of an prothodontic and reconstructive rehabilitation could shorten total reconstruction/rehabilitation time. Introduction: Nitrogen-containig bisphosphonates inhibit the farnesylpyrophosphate, resulting in a decrease in the cellular geranylgeraniol pool. The synthesis of squalenes necessary for cortisone and the prenylation via geranylgeraniol and farnesyl are affected. The aim of this study was to analyze the influence of different isoprenoids on the function of bisphosphonate-treated cells. Materials and Methods: HUVEC, fibroblasts and osteoblasts were incubated with zoledronate. Viability was tested with an MTT test, migration capacity with a scratch wound assay, and the cell morphology was visualized by phallacidin staining. The isoprenoids used were geranylgeraniol, eugenol, farnesol, R-limonene, menthol and squalene. The isoprenoid concentrations for the MTT test were 0, 10, 25, 50 and 100µM. The cells were incubated with 50µM zoledronate for 72h. For the scratch wound assay, the isoprenoid concentrations were 0 and 10µM and 50µM zoledronate. Follow-up or staining occurred after 48h. The tests were performed in triplicate; statistics: ANOVA, post-hoc: Tukey; significance level: p < 0.05. Results: Only geranylgeraniol was able to restitute the cell function and morphology of zoledronate-treated cells. Despite the structural similarity of the isoprenoids, the others were not able to do so. Due to the point of interception in the mevalonate pathway of the different isoprenoids, the inhibition of the geranylgeraniolation seems most important since the other isoprenoids were not able to interfere at all. Conclusion: Among the isoprenoids used, only geranylgeraniol is able to minimize the negative effect of bisphosphonates on the viability, migration capacity and morphology of HUVEC, fibroblasts and osteobasts. Therefore only geranylgeraniol could be used as a therapeutic agent. Introduction: Depending on the primary disease, for some high-risk subgroups older literature describes incidences of up to 20% for bisphosphonate-associated osteonecrosis of the jaws (BP-ONJ). The aim of this study was to reevaluate the incidence found in the Urology Department of the Johannes Gutenberg University in Mainz during a study conducted in 2008. The 2008 prevalence was 18.6% (8 out of 43). Material and Methods: Inclusion criteria were prostate cancer and a bisphosphonate therapy. The study was conducted in the 2nd half of 2011. No participants from the first study were among the new study group. The main criterion was the existence of BP-ONJ. Results: 2 out of 26 had a BP-ONJ (8%) that had occurred after 25 months on average, whereas the patients without BP-ONJ had an on average intake of 12 months. All patients had received zoledronate except one patient with BP-ONJ who had initially taken pamidronate. All patients were referred to a dentist prior to bisphosphonate treatment. 20 out of 26 went to the dentist. 2 patients out of the 6 who did not go developed BP-ONJ (33%), and 0 out of the 20 (0%) that were screened by a dentist did (p: 0.046). Compared to the former study, the overall prevalence decreased from 19% to 8%; if only the patients who were screened by a dentist are analyzed, prevalence went from 19% to 0%. In 5 out of the 26 patients (19%), a tooth extraction was performed with antibiotic prophylaxis and wound closure. 2 out of these 5 developed BP-ONJ. In the former study, 33% of the patients had had teeth extracted. Conclusion: Through a preventive consultation with a dentist, the prevalence of BP-ONJ could be decreased among patients with prostate cancer. Background: In oral cancer apoptosis induction is a key mechanism of radiotherapy. Upregulation of antiapoptotic proteins inside the tumor leads to an advantage for survival under therapy. In vascular cells Paraoxonase-2 (PON-2) reduces overwhelming ROS-production with the potential to prevent endothelial cells to undergo mitochondrial induced apoptosis. Since irradiation typically induces elevated levels of ROS, PON-2 could also protect squamous cell carcinoma against oxidative stress. Further, some cancers (liver, oesophagus, lymphatic tissue) showed overexpression of PON-2. For today expression pattern and functional influence of PON-2 in squamous cell carcinoma of the head and neck has not been investigated. Methods: Basal PON-2 expression was determined in vitro in four squamous cell carcinoma cell lines and in human specimen of five patients with oral cancer by western blot analysis. Induction of PON-2 protein expression after singular radiation with 7 Gray 24, 48 and 72 hours after irradiation was examined also. Simultaneously, activity of Caspase 3/7 was examined for apoptosis detection after singular irradiation and temporary PON-2 knockdown by siRNA treatment. Results: A variable PON-2 expression pattern in vitro and in vivo was detected. Intriguingly, higher basal levels of PON-2 seem to protect cells against radiation-induced apoptosis., while singular irradiation leads to induction of PON-2. On the other hand, temporary PON-2 knockdown leads to elevated apoptosis after irradiation. Discussion: While some tumors showed higher levels of basal PON-2 expression, other tumors upregulated PON-2 as response to therapy. Tumor cells with higher expression levels of PON-2 basal or as response to therapy may have a biological advantage to suppress irradiation induced apoptosis. Objectives: The day-to-day duties of clinicians caused an increased use of iPads during recent years which includes the digital acquisition of medical histories. Our study examines the impact of employing iPads by patients to provide an anamnesis, and on the general procedure to deliver a medical history. Methods: Randomly selected visitants of our outpatients' department were requested to present their anamnesis both conventional by handwritten surveys and digital, using an iPad (Apple Inc., Cupertino, USA). Patients were allowed to disclose their anamnesis in one's own words (free text) or to reply to predetermined questions (predetermined text). As software served "Digital impDat Medical History" (Kea Software GmbH, Pöcking, Germany). The obtained informations were statistically analyzed. The second part of our rinvestigation concerned the ease of handling the iPad, the patient's judgement of medical data protection, and whether patients have private access to a tablet computer, such as an iPad. Results: The patients (n = 100, 53 males, 47 femals) were asked to write down their anamnesis using the iPad. 20 probands refused (7 males, 13 females). The average age of participants was 47 years, the youngest 12, the oldest 77 years. Of the 80 patients cooperating only 20 owned or had private access to an iPad. Out of the 80 patients responding, 38 provided a conventional handwritten anamnesis as well as a digital anamnesis (iPad). The free text responses revealed 68 different informations, the reply to the predetermined text yielded 64 different information. 31 patients provided only the digital anamnesis, and 11 persons failed to deliver a medical history by means of an iPad . With regard to the second part of our study 80 per cent of the probands, using the iPad, evaluated the convenience of handling the tablet computer as excellent, 19 per cent as good, and 2 per cent as satisfactory. An almost identical distribution (percentage) of assessments was reported for the implementation of the iPad technology to generate medical histories. With respect to the privacy of medical data 71 per cent of probands expressed a high, 21 per cent an average, and 8 percent a low trustworthiness. Conclusion: The generation of medical histories by means of digital devices, e.g. tablet computers, is well accepted by patients, suggesting the an increased utilization of tablet computers both in medical clinics and doctor's offices. Both the ease of use as well as the implementation of the survey shows an overall positive in the patients, although there are certain concerns regarding the privacy of medical data. An objective evaluation of digital over written medical histories gives an image of different answers. This may be attributed to the new devices such as tablet computers, although further studies are required to objectify this issue. Introduction: In patients with corneal opacity due to thermal and chemical burns , or other inflammatory disorders of the ocular surface, the risk of rejection of a corneal transplant is high due to strong vascularization and scarring of the cornea in such cases the use of an osteo- odonto - keratoprosthesis (OOKP) is a possible therapeutic alternative. Materials and Methods: We describe a case of a patient who underwent OOKP-surgery, a method first published in 1963 by Strampelli. Our patient had a past history of Stevens-Johnson-Syndrome with subsequent corneal opacity. Multiple unsuccessful corneal transplants resulted in a corneal ulcerceration. The preoperative visual acuity was only hand movement. In January 2013, tooth number 13 along with its root and surrounding alveolar bone and periosteum was removed and cut along the canal of the dental pulp resulting in two halves.Afterwards a disc was prepared from this specimen.A PMMA cylinder was inserted into a transverse bore hole through the dentin and the adjacent alveolar bone. The graft consisting of the synthetic cylinder and its stable biological matrix was subcutaneously implantet into the lower lid for 3 months. In the meantime, the cornea was covered with buccal mucosa. Three months later, the OOKP was implanted into the center of the cornea with the protruding optical cylinder as a light bridge between the environment and the vitreous body. The biological graft was located between the cornea and the overlying oral mucosa. Results: Sofar the follow-up was eight months. No operative complication did occured. The postoperative visual acuity is currently 0.4 which allows newspaper reading and participation in public life. A narrow angle glaucoma, which is a typical complication in about 50% of these cases may occur. Conclusion: The OOKP is a validated, promising and demanding tool for the treatment of very severe corneal conditions .Due to the complex nature of the procedure,its use is restricted to few interdisciplinary centers. Koch, Felix Peter / Yuhasz, Mikell M. / Travieso, Rob / Wong, Kenneth / Clune, James / Zuang, Zhen W. / Houten, Joshua Van / Steinbacher, Derek M.
Background: Transport distraction osteogenesis (DO) can be used to autologously reconstitute calvarial defects. However, distraction gap biology in transport DO has not been adequately described. The purpose of this study is to histomorphologically interrogate osteogenic formation during cranial transport distraction using a novel device. We also evaluate the effect of fat grafting on the regenerate during distraction. Methods: This study was approved by Yale IACUC (# 2011-11393). Ten male New Zealand white rabbits (3 months; 3.5kg) were used (8 treatment, 2 control). A 16x16mm defect was created abutted by a 10x16mm transport disc. The device was fixated anterioposteriorly. Four animals were fat-grafted using 2cc of subdermal intrascapular fat deposited along the distraction site. Latency (1d), active distraction (12-14d) (1.5 mm/day), and consolidation (4wks) followed. Calcein and xylene orange fluorochromes were injected subcutaneously during and post-distraction to mark sites of bone formation. Following sacrifice, osteogenesis was assessed using microCT, histology, and fluorescence. Results: No perioperative complications were experienced. Treatment animals demonstrated regenerate bone between distracted segments on microCT. MicroCT analysis of fat-grafted and non-fat grafted animals revealed a mean density of 2271.95 mgHA/ccm and 2254.27 mgHA/ccm (p=0.967), respectively, and defect bone versus total volume (BV/TV) of 0.0999 and 0.0766 (p=0.5979), respectively. Controls had minimal reossification. Histologically, mean densities measured 43.63% and 8.19% for non-fat and fat grafted animals, respectively. Density ratios (regenerate:native bone) were 53.96% and 23.71%, respectively. Fluorescent microscopy revealed ossification from the callus as well as bone fronts emanating from dura and periosteum. Conclusions: Transport distraction is effective to reconstruct critically-sized rabbit calvarial defects. Regenerate bone arises predominantly from the callus with contribution from surrounding dura and periosteum. Adipose grafting is well tolerated but does not enhance osseous regeneration. Introduction: Pyoderma gangrenosum of the scalp is a extremely rare manifestation of Crohn's Disease in an atypical location. The disease is part of the neutrophilic dematoses. Diagnosis needs to be established histologically. It's longterm outcome is not predictable and pathogenesis is unknown. Potential differential diagnoses are basal cell carcinoma, spinal cell carcinoma, sarcoma, lymphoma as well as cutaneous manifestations of lymphoma. In general, immunosuppressive therapy is regarded as a prerequisite for surgical treatment. Epicrisis: The diagnosis Pyoderma gangrenosum of the parietal scalp was established in an 80 year old female patient who suffered from an acute episode of Crohn's Disease. Further lesions of pyoderma gangrenosum were found at the mons pubis and the external auditory canal. Immunosupressive treatment with steroids, azathioprine and infliximab resulted in remission of the diarrhea with bloody and mucous constituents and progression of the Pyoderma gangrenosum could be prevented. Surgical necrosectomy and decortication at a maximal range of 13 x 10 cm of the exposed scull was performed. After sufficient granulation, supported by vacuum assisted closure therapy, the defect was covered by a split skin graft taken from the right thigh. The patient was followed up for 404 days from first examination and is being continually treated with low dose steroids and azathioprine. So far, there are no signs of relapse. Results: The importance of immunosusppressive treatment of Pyoderma gangrenosum as a precondition for successive surgery was evinced in this course of disease. Vacuum assisted closure therapy seems to be an effective aid in supporting granulation and preventing wound infection. Granaulation tissue originating in the cancellous bone of the skull provided a sufficient basis for alimentation of split skin graft. Introduction: Orthopantomography is the radiological standard for evaluation of teeth and jaws. Though, presentation is limited to two-dimensional data. A three-dimensional demonstration via cone beam tomography is an additional analysis with higher exposure to radiation and costs. Aim of the study was a comparison of visibility and evaluation of pathologies of the maxillary sinus together with possible additional secondary diagnoses via orthopantomography and cone beam tomography. Materials and Methods: Orthopantomographies and cone beam tomographies of patients with pathologies of the maxillary sinus were reviewed. Emphasis was laid on 1) visibility in both imaging physics and 2) number as well as significance of the additional secondary diagnosis. Results: 31 cases (2006-2009) were reviewed. In 15%, the pathology was seen in the orthopantomography. In 85%, additional radiological methods were demanded. In cases of cone beam tomography, 35% new three-dimensional information were seen. 44% of the cone beams were seen to influence therapy and in 6%, cone beam tomography was seen to be mandatory. A mean of one additional secondary diagnose per patient was seen. Discussion: This elucidates the clear and relevant advantages of the cone beam tomography for diagnostics of the maxillary sinus when compared to orthopantomography. The additional information is followed by a higher radiation exposure of the respective patients which is as high as if not less than a computed tomography. Mucoepidermoid Carcinoma of the Palate in a 5-Year-Old Girl: Case Report and Literature Review. Background: Minor salivary gland tumors in children are uncommon. However, despite the low overall incidence, there is a high incidence of malignancy in these young patients which is reported to be above 50%, with mucoepidermoid carcinoma (MEC) predominating. We hope that this well-documented case report will contribute to the enlightenment of the behavior and prognosis of pediatric MEC of palatal minor salivary gland tumors. Case report: A 5-year-old girl was admitted to our center with a histologically confirmed MEC of the left hard palate. Primary incision for drainage of a supposed abscess and secondary biopsy had been performed elsewhere, leading to a delay in diagnosis of 14 days. After further work-up, we excised the tumor to include the adjacent bone; clear margins of 10 mm were revealed. Adjuvant therapy was not necessary. The defect was allowed to undergo secondary wound healing. As of the 1-year follow-up, there had been no recurrences. Conclusion: For differential diagnosis, MEC should be considered in cases of soft, slow-growing, painless, pale erythroid-livid lumps of the palate-even in young patients. Especially for nonresponders to initial treatment, early biopsy is recommended for histological confirmation or exclusion of a minor salivary gland tumor. Introduction: The Bundeswehr Patient Evacuation Coordination Centre (PECC) is responsible for organising the evacuation of soldiers to Germany. The aim of this study is to collect and analyse the data of 166 Bundeswehr soldiers who had to be evacuated to Germany by air from the ISAF, KFOR, and EU NAVFOR-ATALANTA missions in recent years. Methods: By the PECC, we selected patients based on diagnoses of diseases and injuries of the mouth, jaws and face. The data on evacuations was analysed using the SAS 9.3 statistics program. Results: Priority levels were indicated when requests for evacuation from the country of deployment were made. They were distributed as follows. Discussion: The rapid evacuation of even complex cases is an important factor in the medical care of soldiers and at the same time ensures high survival rates after attacks and incidents involving severe injuries. The time from the request for evacuation from the country of deployment to the arrival of the means of transport in Germany was the duration of evacuation. Auricular defects often occur within the context of congenital anomalies, injuries and in particular after surgical excision of benign and malignant tumors. An optimal anatomical reconstruction of the external ear is essential for a successful surgical outcome and contributes significantly to the patient's psychosocial rehabilitation. To cover full thickness auricular defects, we developed the anterior pedicle retroauricular flap. The described flap represents a relatively simple technique for an aesthetically demanding reconstruction of the external ear. Normal emotion regulation in adults with cleft lip and palate: An exploratory study. Introduction: Cleft lip and palate (CLP) represent the most common congenital malformations of the midfacial region. Although these patients show differences in their facial appearance, we hypothesize that CLP-affected individuals do not show an alteration in their emotion regulation abilities compared to unaffected individuals. This is because of the strong biological basis of facial emotion and expression that is inherent and receives little influence from external factors. Material and Methods: The present study evaluated various aspects of emotion regulation in 25 adults with CLP and an equally sized control group of unaffected volunteers. The study was divided into three parts. First, we investigated emotion regulation strategies. Here, each participant was asked to complete the Emotion Regulation Questionnaire (ERQ) and Ambivalence over Emotional Expressiveness Questionnaire G 18 (AEQ-G18). Second, we examined the recognition of facially expressed basic emotions (FEEL test). Third, we evaluated the expression of an emotion induced by an odor sample. Results: Habitual emotion regulation, measured by ERQ and AEQ-G18, was not different between CLP and controls subjects for all of the sub-scales. Recognition of facially expressed basic emotions was also the same for both groups. Facial emotion encoding did not differ for both groups. Conclusions: To summarize, the findings suggest that individuals with an orofacial cleft show undisturbed emotion regulation and recognition. This may be explained by the strong biological basis of facial emotion recognition and regulation as well as by the healthy emotional resilience and social functioning of CLP patients. For all patients, the goal was to achieve significant improvement of function and asthetics via fibular "wrap-around" augmentation. Further advantage of this operation method is transoral positioning without profound submandibular incision lines. However, the method is very work-intensive regarding a non-compromised perfusion due to very narrow anatomical relationships. With limited cases - as a result of the rare occurence of the situation - transoral positioning is the therapy of choice (despite high work intensity). Sustainable augmentation is achieved. It may be suitable to combine the operation method with soft tissue augmentation - for example with fatty tissue aspiration or free SIEA micro-anastomotic tissue transplant. Denosumab is a novel antiresorptive agent used for the treatment of postmenopausal osteoporosis and bone metastases from malignant diseases. The indication is identical as for bisphosphonates, the effectiveness is comparable. Bisphosphonates can cause osteonecrosis of the jaw bone. Cases have been described both in patients with malignant diseases and in the treatment of osteoporosis. Denosumab can also cause osteonecrosis of the jaw. The clinical picture of necrosis is identical. So far, however, only cases of denosumab-related osteonecrosis of the jaw in patients with malignant diseases have been described. This report describes the case of a patient who was switched to denosumab because of gastrointestinal intolerance to bisphosphonates due to a treatment of osteoporosis. After dento-alveolar surgery osteonecrosis to the anterior mandible occured. It maybe assumed that the inhibition of osteoclasts by denosumab and the artificial dentoalveolar trauma triggered osteochemonecrosis in this patient. The case described here is, to our knowledge, the first literature reported patient case of denosumab-related osteonecrosis of the jaw with continuous therapy because of osteoporosis and without the existence of an underlying malignant disease. The authors recommend a dental treatment as recommended by the AAOMS and AWMF both before starting bisphosphonate therapy and before starting treatment with denosumab, regardless of the indication or underlying disease.